Anecdotally, most market practitioners and investors likely believe that the market often overreacts to news. This happens often around earnings announcements, when a company surprises to either the upside or downside and the share price reacts materially. If you believe a company’s value is based on its discounted estimated cash flow over the next 10 or 20 years, why would one quarter’s results matter so much? A company can miss the mark by just a couple pennies in earnings and the market may cut 5 or even 10% off the value of the entire enterprise. This clearly does not reconcile with a miss of a penny or two in any discounted cash flow model. Is this potential overreaction caused by investors’ short-term focus? Could it be that once a stock starts moving, high-frequency trading algos pile on and push the share price momentum even further in the hopes of generating some short-term trading gains? Or could it simply be that we are just emotional when things are moving, and the herd mentality causes many investors to make similar behavioral mistakes. If market participants overreact to earnings or other big news events, can this create opportunities to profit? In this edition of Ethos we will share some of our findings around market overreactions. There is not one simple rule on when to take advantage of overreactions, but there are some scenarios that appear profitable and worth considering. There is no question that as humans, investors often overreact to news. This is often driven by a few behavioral biases that are well documented and prevalent to some degree in all of us. We all have behavioral biases and emotional heuristics. These are the shortcuts that evolution and our brains develop to help us manage our lives. The vast majority of these are very helpful and aid us to operate efficiently every day, but when emotions are elevated, these shortcuts can lead us to make poor decisions. Investing is generally not an emotionally charged endeavor, that is unless things are moving. During a regular week when markets are up a little or down a little, many investors’ emotions are even and balanced. Now add some volatility, like the TSX down 5%, and you see emotions elevated and that is when overreactions happen. For most investors it is their savings that are moving in value which causes us to become emotional and more susceptible to making poor choices due to our behavioral biases. In this report we are looking at instances when individual companies change value abruptly. We are not talking about the overall market. The biases that are most likely to trigger a poor decision by an investor includes Recency Bias, Focusing Effect and Availability Heuristic (see descriptions on page 1 bottom right). The biases can be caused by either company-specific events or general market events. If stock prices quickly and accurately adjust to earnings announcements or other big news, after the one-day abrupt adjustment, future trading should be inline with the broader market or in-line with the broader market adjusted for beta. 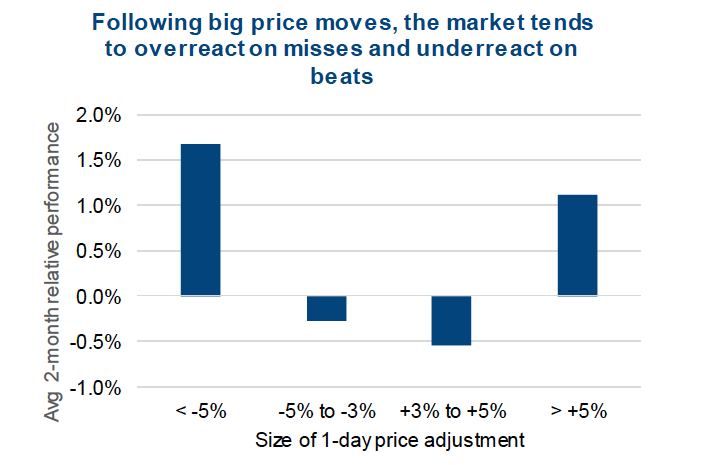 We don’t believe this is always the case and in many instances share prices overreact and can partially revert back. For this analysis we started with the S&P 500 members, analyzing all instances when individual companies had a +/- 3% move a given day. Over the past 5 years this totalled about 15,000 instances. We would add a caveat that over the past 5 years, markets have largely been moving higher. This does not negate the findings, but should be incorporated into any analysis of the results and gives us paths for further analysis. The market seems good at adjusting to minor price changes, either up or down. The chart below only contains companies with a beta of 0.95 to 1.15, to avoid both high and low beta companies. The bars are the average 2-month performance relative to the S&P 500 index, following various sizes of abrupt price changes. If the sudden price change around news or earnings was either +3 to +5% or -3 to- 5%, the market seems to have adjusted quickly and accurately to the news, on average. However, if the news triggered a share price change that was greater than +5% or less than -5% (big moves), the market seems to have not gotten it right. On big misses, the share price seems to overreact to the downside and makes up some of this lost ground over the next few months. On big positive surprises, the market does not seem to adjust enough as these companies on average continue to outperform the market. After analyzing the size, beta, historical volatility, the pre-existing trend of the company, there appears to be a good indicator of how the share price will perform following a sudden price adjustment. We can’t help it, but it seems the trend is your friend in this case. Companies in an established uptrend, as measured by the slope of their 50-day moving average, show strong positive absolute and relative performance following a big downward surprise. Conversely, companies in an established downtrend that enjoy a positive surprise, tend to give some of those gains back on a relative basis. Portfolio Management Implications – The market appears to have a tough time adjusting to big changes in a stock’s share price. At the very least needing more time to absorb the data that caused the initial move. Of greater interest from a trading perspective, it would seem that big price drops often see a good degree of price recovery over the subsequent months. And this is more evident if the share price had been in a previous uptrend before the big miss or negative news event. 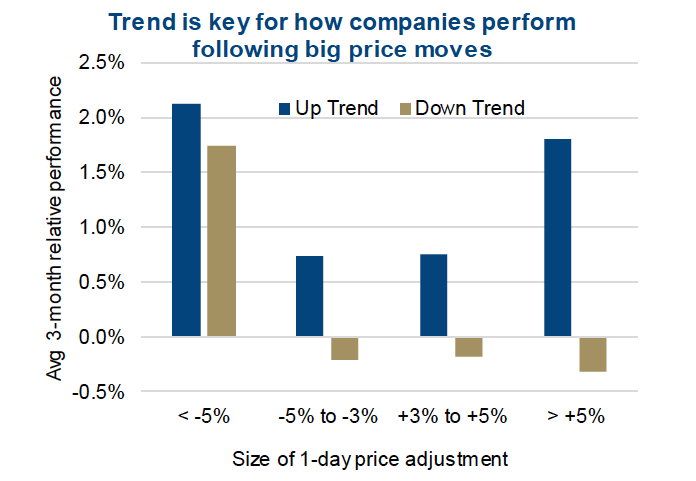 Conversely, companies in a downtrend that see a sudden positive price change, appear to give some of those gains back. In other words don’t fight the original trend.